Drain water and grind it to a coarse paste.Add little water if required. In a non stick pan heat oil, add mustard seeds.After splutter add asafoetida, add 1/4 cup water + ginger, garlic and chilly paste + turmeric pwd and salt.Mix it well. Add ground chana dal, mix and cook on a low flame, covered. After 5 min add milk,mix. When it is cooked properly add sugar + sasame seeds + 2 tb. coriander leaves + raisins and cashew and mix well.At the and add lemon juice mix and take out in a serving bowl. Serving tips:- 1.Do not serve hot, let it come to room temp.2.Garnish with coriander leaves + pomegranate seeds + fine sev in individual plate. 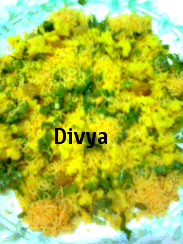 Indian snack items r my fav, Thanks Divya 4 posting.